Carolingian culture: emulation and innovation. Yes, more merovingian. I know, like the bizantine spear, 600 AD, like german. Call "lancea"
While in the early first century allied troops borrow weapons from the Roman, in late imperial period we are witnessing the spread between the legionary troops now barbaric, elements typical of other peoples. Perhaps the greatest influences come from Germany and eastern borders. The Frankish spearheads appear unusual. Why? My doubts are about the swords do not appear in the sixth or seventh century. That sounds logical, but the fact remains that many migration age burials have some pretty essential equipment missing. For instance helmets seem much more rare than very high status swords... Let alone body armour. much more rare than very high status swords... Let alone body armour. Perhaps due to a difference in ownership? If a sword is a personal artifact, and armour belongs either to the army or family (handed down from generation to generation) etc. Swords, shields etc. are expendables, but armour can be repaired and remain in circulation much longer. Could be, but then some grave do contain helmets or armour. 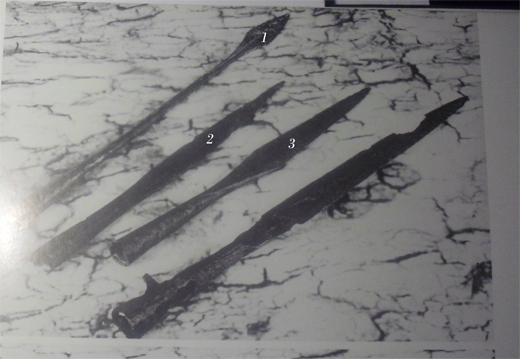 And evidence also suggests that at least some swords have been used by a few generations. Stories of swords being used by a number of generations also feature prominently in various sagas.